My son is crazy about this set:) It is warm and soft. Give your kid's room a modern, creative touch with this Minecraft themed quilt set. With a charming Minecraft pattern, the quilt set offers a playful update to any decor, and the soft polyester construction ensures cozy comfort. Came today. I just opened it real quick and wrapped it back up just to make sure pieces were included as it is a Christmas present. Packaged nicely and just as described. My son has a queen bed and although it will fit know if won’t hang as low as his current quilt set. He loves Minecraft and will absolutely love this set. He put did put a Minecraft comforter on his list and this is the best price and size I could find. I am not turning his whole room into everything Minecraft as next year he may be over the phase and I just redid his room and it looks so nice:) Since I did just redo his room I did not want to spend too much money as this one will not be his main bed set. However, the quilt and shams seem to be good quality just from taking I out and looking at it. So if he does get attached I think it will hold up, but that is just my opinion from expecting it over quickly for any snags, stitching problems , and any imperfections. He is going to love it. If you have a daughter or son that loves Minecraft, this is a good deal and seems to be better quality than the two I saw in person at the store. Love this Minecraft quilt so soft. Good quality. All my son's love it, going to buy one for my two nephews. Fits the bed perfect true to size. Our son loves this set! He sometime will put his weapons in the pillow that acts as a Minecraft chest. The stitching is done well, colors are vivid and images are accurate to actual Minecraft entities. A must have for all up and coming Minecraft fans! An all time favorite gift for my 4 year old grandson he made a bigger fuss over this set than most of the toys he received on Christmas. The colors are vibrant and the picture is pretty true to color. I highly recommend for the Minecraft fans in your family. This is a nice soft comforter. My son did not complain about it being crunchy or hard. It is a Full/Queen, on his queen, it is not as large as a "queen" comforter. My son slept with it on his bed when he got it and he only likes blankets. It is thin and not heavy. I would recommend this product, great for kids. This is wonderful!!! Great quality and loved the colors and designs. My grandson is a Minecraft fanatic and he is having issues with sleep. Got this as a gift for him....he loves going to bed now and the room came alive with fun and games. This set is very cool and functional. We live in the midwest and it gets quite cold at night. 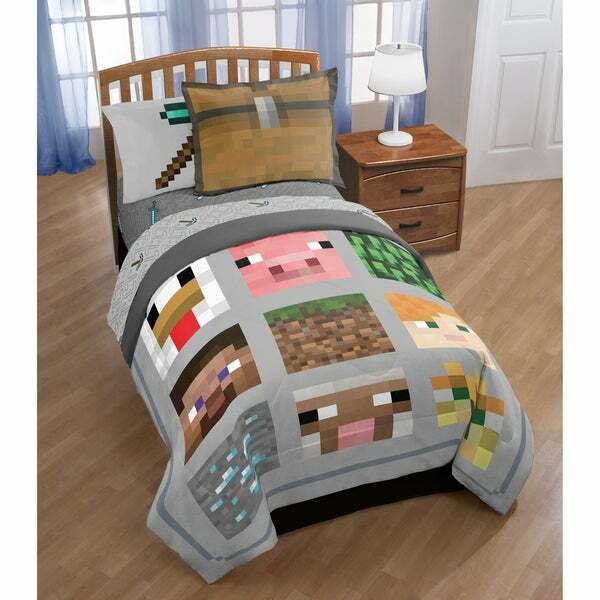 This comforter will keep our daughter warm, but also go very good with her other minecraft themed items. The quality of this set seems pretty good. The only negative remark about this is the material is a little rough would be nice if it was softer. All in all not bad though. I would recommend to a friend. Bought this for my son. He absolutely loved it! It's very large for his twin bed but he loves to cuddle with it. Very good quality. I would highly recommend this. Adorable,great colors! Grandson just loves it. We bought these for my son‘s seventh birthday, and it looks awesome on his bed! He is thrilled with them! My 10 year old grandson loves it. Enough said.